Across different fields of painting, sculpture, craft, calligraphy and photograph, all the members of our society helped each other to create the bench as a symbol of the past, present and future in a motif of "Kokiriko-bushi" (folksong of Nanto-city). 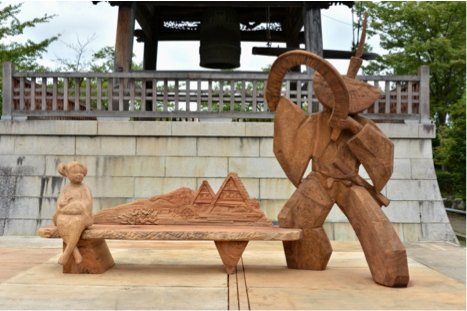 For example, our past works of bench include （Sasara dance）、（UNESCO World Heritage　A-frame）、（Local Girl）. We hope a lot of people will sit on this bench with a smile. Also, we want to hand down the future to girls and boys, wishing eternal peace of Nanto-City, Japan and the world.